In April, Jeff Sessions, the US attorney general at the time, announced that authorities would prosecute anyone who crossed the border illegally. He said this new approach - which ended two months later - was aimed as a deterrent to parents with children but as a result, nearly 3,000 youngsters were separated. The border policies and her defence of them have been contentious, and some experts believe that her gender plays a role in the controversy. Ruth Ben-Ghiat, a New York University professor who studies propaganda, says that Ms Nielsen has been a powerful spokeswoman for the policies in part because she is a woman. "It's very important for normalising this kind of inhumane treatment. She's the soft face of this hard policy." Ms Nielsen has embraced the president's approach to managing PR crises - dig in your heels and face critics in a blunt, no-nonsense manner. As a woman, though, she has been subjected to particularly sharp criticism - Cruella de Vil, said one, describing her as a Disney villain. Some appeal to her conscience. "How do you sleep at night?" was the cry while she was dining in a Mexican restaurant last year. Her position as a high-profile, female member of the president's cabinet is made more difficult by the fact that the president himself seems old-fashioned in his views of women. He often says he loves women and talks about female beauty. Yet few women wield power in the administration: as an Atlantic study shows, twice as many men as women have been appointed to positions. The dominance of men over women in the Trump administration occurs at a rate that has not been seen "since the Reagan years", says Debbie Walsh, director of the Center for American Women and Politics at Rutgers University. Ms Nielsen is one of the only women who serves in the upper echelon of the administration, and her main issue, border security, is of intense interest to the president. Her job is a high-wire act, and she has done it with steely focus and determination. Some observers say it is her straightforward demeanour and mastery of the brief - not the fact that she is a woman - that makes her a strong advocate for the president's strategy. "She's thought through all these issues at a policy level," says Raj Shah, a former deputy communications director for Trump, adding that her approach to border security is both "effective" and "humane". Others point out that the president admires a hard-nosed approach in public discourse, whether in a man or a woman. "He appreciates toughness," says the Heritage Foundation's James Carafano. "The fact that she might ruffle some feathers - I think he'd find that endearing." Image caption Separating children from parents, said Rep Lauren Underwood (left), is "immoral"
Getting power and holding on to it is tricky for women in any White House, but the process has been particularly fraught in the current one. Two of the most prominent women, Counselor Kellyanne Conway and Press Secretary Sarah Huckabee Sanders, work primarily as advisers and spokeswomen - not as policymakers. Aside from Ms Nielsen, only four women - CIA Director Gina Haspel, Education Secretary Betsy DeVos, Transportation Secretary Elaine Chao and Linda McMahon, the head of Small Business Administration - hold positions in the president's cabinet. One woman, Nikki Haley, held a position with a cabinet-level rank as ambassador to the United Nations, but she resigned last autumn. "It's kind of a double-edged sword," says Heidi Hartmann, president of a non-profit organisation, the Institute for Women's Policy Research in Washington. "It really is hard for these women to walk the right line - they are seen as either too strong or not strong enough. I think there's implicit bias." The 47-year-old Ms Nielsen heads up a sprawling agency with more than 200,000 employees. In their offices in northwest Washington, a heavily guarded constellation of buildings, deputies praise her for her work ethic. After studying at Georgetown University and University of Virginia's law school, she worked on homeland security issues in the George W Bush administration. She got to know John Kelly, a former military commander, during Mr Trump's presidential transition and worked for him while he was secretary of homeland security. She followed him to the White House when he became chief of staff. 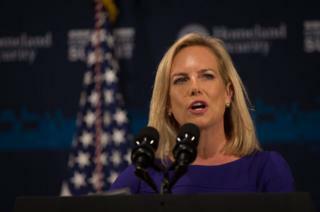 When she took over from him as homeland security secretary in December 2017, she brought considerably less experience to the position than her predecessors, and her views on immigration were relatively unknown. Mr Kelly was known as an immigration hawk, but not her. Her father, James McHenry Nielsen, a Florida doctor, served in the military, and some of her colleagues say that she is driven by a desire to serve the nation rather than by policy goals. Others are less charitable, saying that she is an opportunist: "There's a lot of perks that go with being a cabinet secretary." Setting aside her motives, Nielsen has had a difficult relationship with her boss. "I want her to get much tougher," he said on Fox News Sunday in November. "We'll see what happens there." The New York Times reported that she thought about quitting after being on the receiving end of a Trump tirade over the number of undocumented immigrants who cross the border. He is hard on members of his cabinet, whether male or female. Still many people say that he speaks differently to her. "Trump felt like he could rip into her in ways that he didn't feel like he could with Kelly," says David Martin, who worked as a lawyer for the department of homeland security. "It's partly because she's a woman." In response to the president's criticism, Ms Nielsen has doubled down on her efforts at ensuring security at the border. 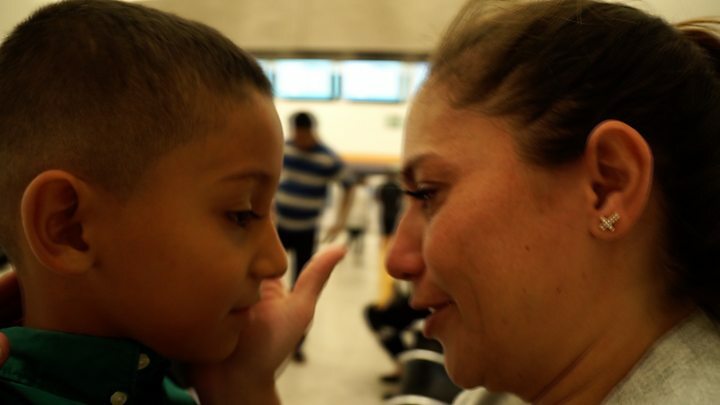 The number of apprehensions at the border rose from 51,857 in November 2018 to 66,450 in February 2019, according to the US customs and border protection office. Her strategy seems to be working - she has remained in her job and received praise from the president's wife. In November Melania Trump said she was "proud" to be with her at a White House event. But for progressives, Nielsen's combative style and the fact that she is a female advocate for the president's policies has struck a nerve. Carrie Baker, a women's studies professor at Smith College in Northampton, Massachusetts, says that she is offended by the way Ms Nielsen argues for policies that could harm women and children. "They are able to find women to do their evil deeds and defend their misogynist work, and they think that's a good strategy," Ms Baker says. "I think that's wrong. Women are seeing through it."